It’s time to accept that we are not going to dislodge the entrenched interests holding back effective action on looming climate chaos by any means tried so far. Believing that 97% of credible scientists is consensus enough is 103% short for effective response. (Even 200% may not be enough.) Undeniability and incontrovertibility are the only criteria that will work to break through the Hydra-Headed Delusion Dragon clutching all of us. 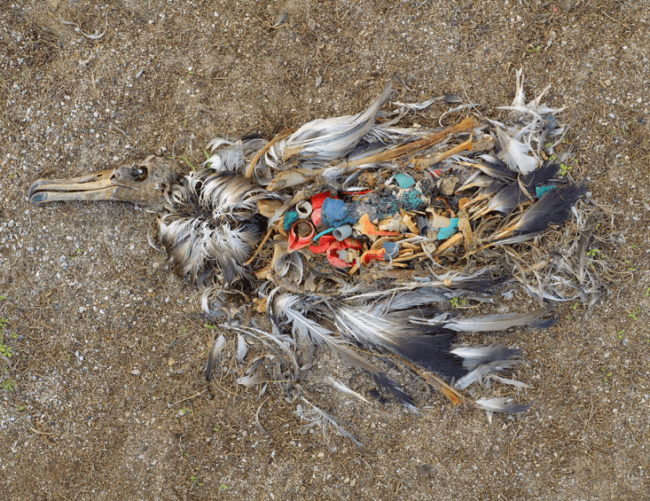 Plastic Pollution Coalition’s video “Open Your Eyes,” shows the horror and disgust of our collective despoliation in less than four minutes. Another approach is to go to Coastal Care’s “WHEN THE MERMAIDS CRY: THE GREAT PLASTIC TIDE” and simply scroll down for about three minutes through the pictures. 2. Snuffing out the remaining mammals except for humans and our domesticates. 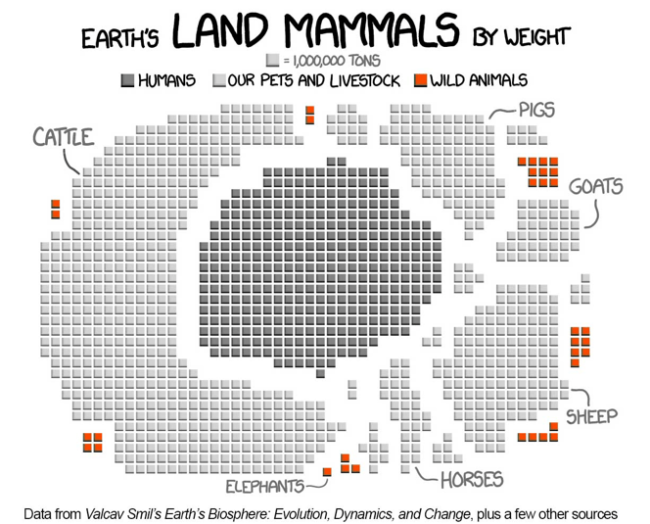 The visual below depicts humanity consuming the biosphere: humans (dark gray) and our livestock-pets (light gray) now comprise nearly all the mass of land mammals (98%), while wild mammals (red) cling to the very edge of existence (2%). 3. In America, taking over 200% of what the Earth can regenerate each year, spending over twice our real income. This graph measures the annual biological capacity “load” put upon the US by its population, per person from 1961-2012. Americans consumed about double the country’s natural “yearly income” in order to “enjoy” their lifestyles. Therefore, enormous natural capital of the nation is destroyed, degrading overall bio-capacity and Life-Support Systems for future Americans. 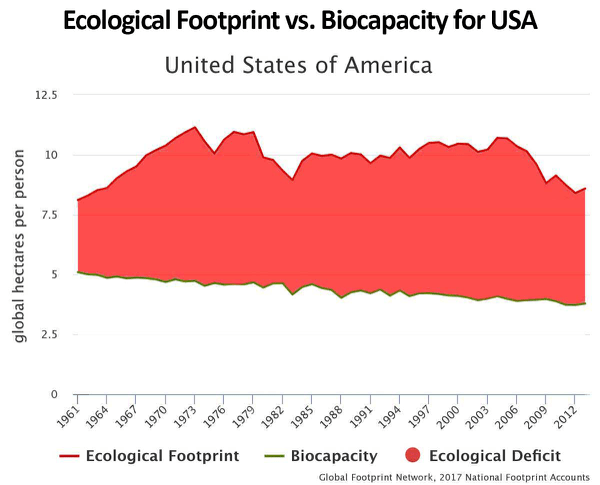 The Biocapacity of the United States declined almost every year through 2012. Simultaneously, globalization makes it increasingly easy for the footprint of the United States to cast far beyond its borders, bio-capacity, and people. With extraction, consumption, and pollution continuing—anything like current rates—collapse is inevitable. At its interactive site, Global Footprint Network, provides information on the growing ecological deficit for the USA. “The second half of the 20th Century is unique in the history of human existence. Many human activities reached take-off points sometime in the 20th Century and sharply accelerated towards the end of the century. “The last 60 years have without doubt seen the most profound transformation of the human relationship with the natural world in the history of humankind. Spend a minute or two with the Great Acceleration PowerPoint that displays the human-driven impacts related to our Earth, her resources, living systems, and life-support systems. 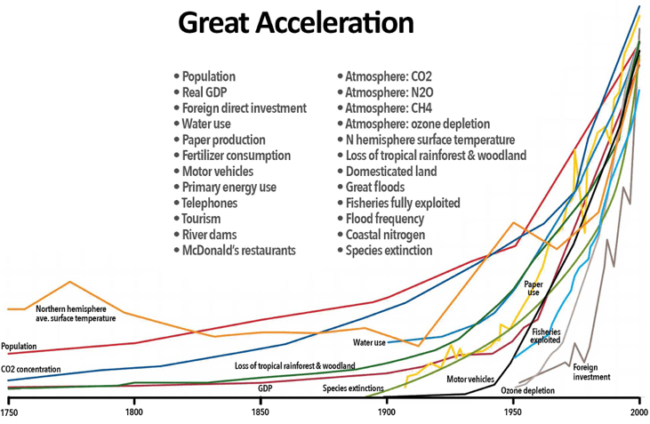 These astounding, burgeoning impacts predict collapse. We just don’t know exactly when. 5. Finally, the “Tinkerbell-Effect” makes current international efforts at climate stabilization vacuous and insane. 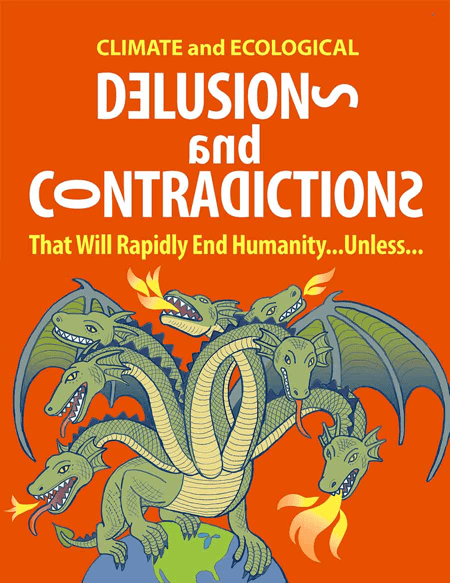 The free e-book “Delusions and Contradictions,” at www.FighttheDragon.org explains the delusions that even those trying to stabilize our climate system at the world-agreed 2◦C heat ceiling are suffering under (pages 11-21). Find out why not one nation in the world is taking seriously the Paris Climate Agreement. The five factors here (one could add a dozen more) show incontrovertibly that we are on a fast path to comprehensive self-destruction. The point is to see and feel it, to understand the Dragon dominating us so that we wake up and help sound the alarm, to trigger our fight-or-flight survival system before we hit the wall fast approaching. Then, it is critical that we respond by reaching for the entity and organizations with the financial and human resources that can come to our aid and respond at this late date. That entity and its organizations are the ones who express that they love humanity, by their very name. 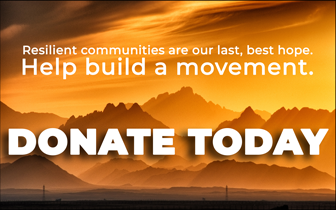 Philanthropy, literally meaning “lover of humanity,” is that entity. We must ask them to sound the general alarm, then to continue to help us with their vast resources, their 100s of billions of dollars. Once the human survival response is triggered and the general alarm is sounded, philanthropy’s financial and human resources can help drive humanity back to balance and weather the coming disasters. The key to this disastrous situation we are in is to respond; raise the general alarm! A New Chance for Climate Justice? Because I am very concerned at the likely impact of climate change on my grandchildren. The Twilight of the Great Burning: What Comes Next?